« Bootights, a great new product! I am not sure what has caused this subtle shift, but I am going crazy for prints this season! Maybe because there are so many options out there this season with florals, stripes, color blocking and much more. Never one to shy away from a print, especially one that is appropriate and the right scale (more on that later), I am finding so many possibilities that I am dubbing spring 2011, the year of the print! 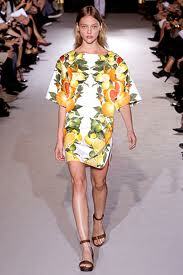 Stella McCartney tops my list with her beautiful “fruit print”. I saw this in Neiman’s and bought it for a client and it was just so incredible on. The picture is the dress, but in the stores it was being shown in a tunic…very Palm Beach! This print was so realistic, that when it was on my client, I went to wipe away a droplet of water, not realizing it was part of the fabric…gorgeous! I am also really loving this season’s color blocking. I know this look is a bit bold for some. I think that it’s really a great way to showcase a signature piece, keeping all other pieces neutral. Check out this picture of the Tania coat by Milly. I love the way this is worn with a LBD (little black dress) underneath. I had to have this coat and am happy to say it is happily residing in my closet as I write this. You will be seeing me in it a lot this season (and the next and the next) in order to lower my “cost per wear”! I can’t talk about great fabric without mentioning one of my very favorite local designers,Lesley Evers. Lesley is a fabric designer as well as a clothing designer. Her silhouettes are simple but totally fashionable and the fabrics are FUN, FUN, FUN! I want one of everything that she designs, and the line is limited to dresses, skirts and tunics. Somehow though, that feels like the perfect selection. Remember when wearing prints, they should be in a similar scale with your body size. In other words if you are petite, stick with a smaller subtler print. If you are on the larger side, you can go with a bigger, bolder print. More than anything, have fun with it and see whether you don’t go crazy for prints yourself! This entry was posted on Friday, April 8th, 2011 at 4:46 pm	and is filed under Seasonal Trends. You can follow any responses to this entry through the RSS 2.0 feed. You can leave a response, or trackback from your own site.